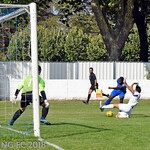 After four fruitless league and cup games Barking secured their first three points of the first season and a welcome clean sheet thanks to a three goal victory over early table toppers and old rivals Romford. Both sides showed promise from aerial attacks but it was Barking that took the lead after 29 minutes as Darelle Russell got the final touch on a long throw to give the home side the lead. Both sides continued to look dangerous but the score line stayed the same at half time. Romford buoyed no doubt by a firm half time team talk stepped up in the second half and thought they had an equaliser after 56 minutes but a curling effort rebounded off both posts before going wide with Barking keeper Emmanuel Olajide rooted to the spot. Romford missed another gilt-edged opportunity after 76 minutes as a penalty for handball was skied over by Toby Barlow. Salt was rubbed in the wound as just a minute later Ola Ogunwamide was found by fellow sub Afolabi Obafemi with a clever pass and he crossed perfectly for Darelle Russell to prod home his second. Sub Ogunwamide continued to impress as he won an injury time penalty for Joe Bruce to convert and finalise all three points. Please note that the opinions expressed in this report are those of the author and do not necessarily represent the views of, nor should be attributed to Barking Football Club.